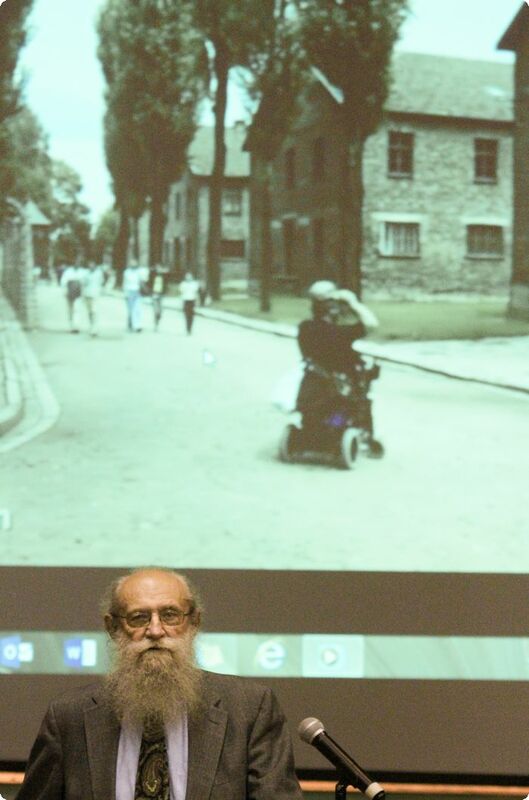 Joseph Hirt in front of a projected image of the Auschwitz Museum as part of his multimedia presentation at a Pennsylvania school. He visited Auschwitz as a tourist, but falsely claimed to have been a prisoner there in 1942, bravely escaping after 8 months. Andrew Reid is only a middle-school history teacher, yet he recognized that some things Joseph Hirt was saying in his multi-media lecture didn’t tally historically, and also logically. 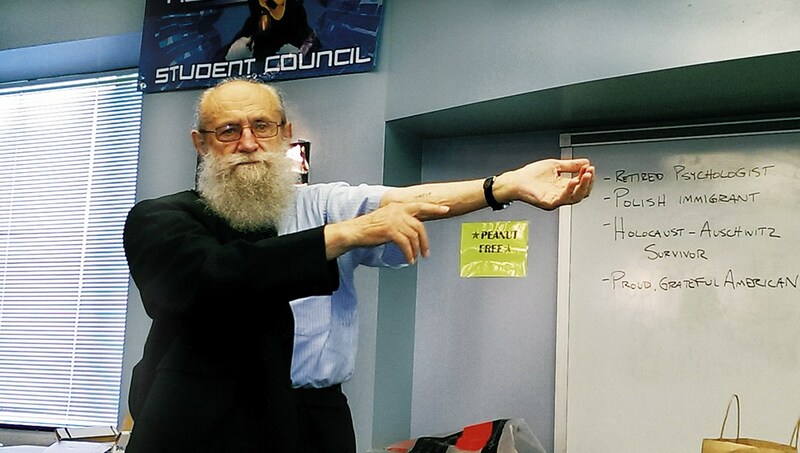 During Hirt’s long tenure of speaking in schools (in many cases the same school, same teacher, to new students each year), no other teacher or administrator, or parent or member of the audience, ever questioned what Hirt said. That is surprising, and reveals an unhealthy unwillingness to think critically about the “received truth” of the Holocaust. It has come to be treated as a religion, but is defined as a historical event. This will be discussed further in Part 2. In this regard, it’s important to know that Primo Levi spent 9 months in the Soviet Union after he left Auschwitz. He was in a Soviet camp for former concentration camp inmates … wonder what was taking place there? Without a doubt he was being trained for the work he was expected to do, he was willing to do, and he did do: writing and speaking about his Auschwitz experience as one of living in a dehumanizing murder factory. When he returned to Turin, Italy in October 1945, he immediately began writing. What he wrote was a perversion of the actual conditions he experienced, and of the attitudes of guards and co-workers. Yes, Levi functioned as an agent of the Soviet Union, an agent for spreading communism and destroying nationalism. And Joseph Hirt takes his beliefs about Auschwitz directly from Primo Levi. Levi’s first book may be the first holocost surliever story to be published after the war (1947), and became a model for others to follow. Certainly Elie Wiesel would have read it and got many ideas from it. But Levi never spoke of “gas chambers” except as rumors that he was questioning. And then only one was imagined. That had to be because the atmosphere they were living in didn’t suggest Germans would do such a thing–that foul lie took awhile to gain momentum, to get people to believe it. In 1976, 29 years later, an appendix appeared in If This Be a Man describing the “gas chambers” (plural) that he did not mention previously. Sounds ridiculous now, when we know they were shower rooms. As an advanced graduate in chemistry, Levi had to know it then, but it was more important that he update his best-selling book to make sure it included the latest official position on “gas chambers.” We can also read in The New Republic Levi’s diabolical comparison of “German” to “Soviet” camps. They were fighting a brutal war, fighting for their life, so really didn’t have the luxury to devote the resources required to exterminate 24,000 people in a day. Pray tell, how was it done? We’ve yet to learn that. Stalin, on the other hand, was in a different class. Get it? This is Soviet-Stalin-Communist apologetics. And this is who Joseph Hirt admires and relates to most of all. He doesn’t mention Elie Wiesel or any other well-known surlievors, just Primo Levi. His attitude toward the Germans is just as fiercely hostile as is Levi’s. Do you see the guarded expression on this face, the look of someone who is in the grip of an addiction and fears to be confronted with it. The apology letter then moves to the ‘dangers’ his family was exposed to during the war years, seeking safe places to settle. He says their “first plan for departure” was from Belgrade, completely ignoring the town he was born and lived in — Horodenka, Poland — now Ukraine. His family didn’t leave there until 1939, just before the Germans invaded. This lapse seems to be part of Hirt’s general tendency to want to prevent knowledge of his past, since he is playing a role. Dot said her husband was born in 1925, although his “replacement wartime” papers said 1930. Asked if she thought it was a clerical error, Dot said she wasn’t sure, but that Joseph was not responsible. “The information from the nephew who knows nothing about this was assumed to be correct. Some of it was not,” Dot said. Clearly, Dot is an enabler for her husband. Joseph Hirt being born in 1930, makes him only 9 years old when the family left Poland, and only 14 when they arrived in the United States. That is too young for his tale of being taken to Auschwitz in 1942 and made a forced laborer. That’s why he changed his birth date to 1925, making himself age 17 (instead of 12) in 1942. Dot did not accept what Andrew Reid found out about her husbands tattoo, either. The Philadelphia Inquirer’s 2006 story about Hirt gave his number as 194517, while Primo Levi’s was 174517, as published on the Bryn Mawr College website. Dot and her husband, meanwhile, claim they don’t know where the 194517 sequence found in the Inquirer article and Reid’s research came from. “The number was a sincere effort to show his respects [to Levi],” Dot said of her husband’s decision to get the tattoo. If you magnify this image the way I described on this page, you can make out the last four numbers – 4517 – on Hirt’s arm, but the first two numbers are still too small. However, a 19 cannot be ruled out, from the look of it. To act confused about the number seems to be simple dissembling. Hirt either made a mistake in copying it, or he purposely changed one number so that he could have it both ways. He emphasizes the difficulty his family had during the war years but the biggest trauma he could come up with was that they suffered from fear. Well, they and many millions of others, no? But they were actually very luck, and even fortunate. When Belgrade was bombed in 1941, they crossed over to Italy and spent time in a detention camp until the American victory in Sicily changed things for the better. When Italy changed sides, they were no longer illegal. He writes that he and his father couldn’t wait for the Allies to take Mount Cassino, so they crossed the front lines in the snow and fell into the hands of an enemy snow patrol. His father was thrown to the ground and his fingers broken by being “trampled by uniform boots.” Sorry, but I think this is another case of Joseph Hirt’s need to embellish. Either it’s complete fantasy or the father’s fingers did get stepped on inadvertently, maybe only one or two damaged, since shortly afterward his father was still making the decisions for the family. By the way, Hirt came from a well-to-do Jewish family. That’s why they could leave before Sept. 1939 and seek a safer place to live. And they did eventually find safety … in America. With their family intact. Once the Americans had complete control of Italy, his family was assigned to a convoy headed to New York from Naples in July 1944. A serious adjustment problem for me had to do with social behavior. I was on the street in Belgrade, returning with food for the family when an SS officer stopped me and asked my name. I stood at attention, looked straight into his face, and made eye contact. At this point he hauled off and struck me in the nose and chin with his clenched fist. I ended up on the ground, bleeding from my nose and mouth as he screamed at me “How dare you, you Untermensch, look at me, a member of the master race. You look at the ground. Show humility. Be humble.” As I lay on the ground bleeding, he kicked me in the ribs as he walked away. Personal accounts like this, sans witnesses or definite time and place, are much-used by surlievors because they cannot be checked out. “On the street;” in “Belgrade” (a very large city); “bringing food to his family” (such a good boy); an “SS officer” (no rank, no description); “stopped him” (for no reason); “asked his name” (he would have been asked where he was going, not his name). This fictional SS man was not functioning as a guard who was checking people because after “he kicked [Hirt] in the ribs” he walked away! This fictional SS man must have been an off-duty loner, walking the streets looking for untermensch to bully. A story like this is meant to show the SS as out-of-control thugs who would beat and even kill innocent Jews for no reason, for sport. And what’s more, during the time he was in Belgrade (1939-41), he would have been anywhere from 9 to 12 years old. Don’t tell me any trained SS officer would punch a kid in the face or say those words. It’s a disgusting lie. There are many stories like this told in survivor “memoirs” and that’s why I call them surlievors. They deserve the name. The word Untermensch was not commonly used by Germans, nor did Germans ever refer to themselves as “the master race.” That term was dreamed up by enemy propagandists, and especially by Jews (projection) who want to create hatred and scorn against National-Socialist Germany and, by extension, reinforce a crude, untrue stereotype of the German character. 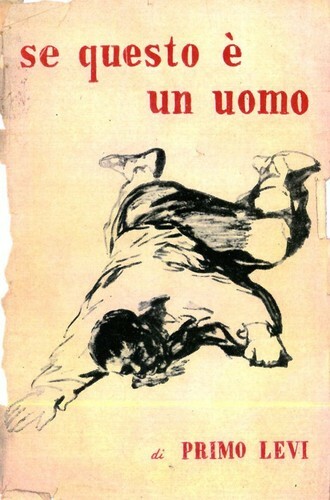 And please take note of the similarity with Primo Levi’s famous book cover that is illustrated in Part 1 and shown at right – do you think he got the idea from that image of a man sprawled on the ground with a bloody face? I do. It might have also inspired the story of his father’s broken fingers. He says he traveled to the Auschwitz-Birkenau Museum and Memorial (no date given as to when) “to confront [his] devils.” But I believe he went there so he could become familiar with the layout, see it in real life, and learn what he could to prevent mistakes in his story about spending 8 months there as a prisoner. But he was not impressed at all by the place and this distressed him. It was merely another “clean and polished tourist destination.” Plus, “Visitors commented quite openly that stories circulating about Nazi cruelty, persecution and death having occurred there were ‘propaganda’,” he said. And they laughed about it. 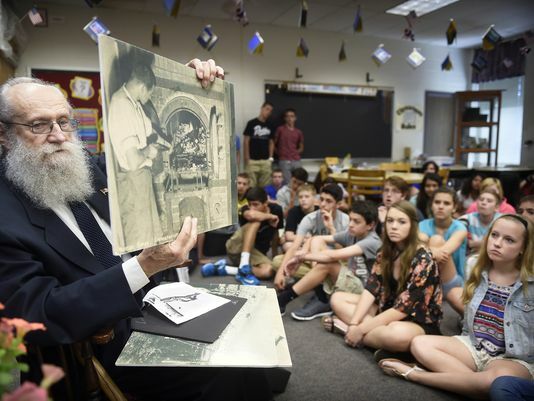 Fraudster Joseph Hirt invested in photographic blow-ups of various atrocity propaganda images to impress on the minds of 6th and 7th graders the beliefs he wished them to hold about “the Holocaust.” This subject is too controversial to be taught to middle-schoolers, but is because they are at their most impressionable then. The above image is the result. 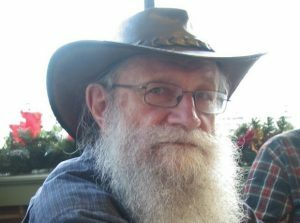 Posing as a survivor and volunteering his time and talents to the indoctrination of schoolchildren, he was welcomed with open arms by teachers and administrators, even parents. No one questioned if what he was saying was the truth about “wartime life (and death) at Auschwitz.” It’s curious why that is. But it’s considered impolite to do so. The problem here is who says what is the truth? Like any religious fanatic, Hirt is sure he has the truth. But he himself has told many lies publicly, claiming they were true. He went to great lengths to push these lies on gullible young people, and to oldsters sitting around tables in a coffeehouse. He even told them to TV reporters. So how can such a one claim to know the truth? He defends himself by saying he was only trying to help the truth, to get people (Christians mainly) to believe what he says is truth. So how does one, and why would one, listen to someone who has already proven himself to be dishonest? And, by the way, he was also passing himself off as Christian (thinking he would be more convincing that way, I assume); I don’t know if he retracted that yet. He uses phrases like “I swerved off in a wrong direction” and “used poor judgment and faulty reasoning.” But never, “I lied and I abused your trust by lying to you. I don’t deserve your trust anymore.” No, he would like to continue, and maybe write a book. I would suggest he do some reading in Holocaust Revisionist literature, where, I am sure, some of his unanswered questions would be answered. Such intense feeling is associated with religious conviction, when the subject of your interest involves the deepest meaning of your life. Hirt got caught up in an obsession about the victimization of Jews – the mind-boggling number of 6,000,000 Jewish individuals that the myth insists on, the supernatural events happening everywhere – and he couldn’t look away from it. For millions of Jews “The Holocaust” substitutes for their religion. Judaism as a religion is demanding and rather contradictory – and is also not so very relevant in modern times. “The Holocaust,” on the other hand, is responsible for the successful founding of Israel, for completely funded it through the early years – and still does in large part today! It also gives Jews privilege and protection. The importance of the holocost for Jews cannot be over-stated. So Joseph Hirt’s obsession with it is more practical than spiritual. If the world stopped believing in the holocost what would be the effect on Jewish life? It’s something they don’t want to even imagine. 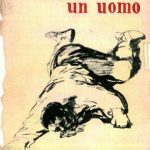 Now, if it really happened as they say, as Primo Levi and Joseph Hirt (copying him) say, then yes, by all means, it should be remembered forever and memorialized. But the evidence shows it did not. There is no evidence for the number six million (or five or eleven), for homicidal gas chambers, or for an intention to exterminate an entire people. So what is the purpose of remembering and memorializing something that didn’t occur? That is manipulation. I suppose that it will take another twenty years before these liars and imposters are all dead. Who will continue the lies? Maybe their grandchildren will continue to tell fairy tales about old gramps and those nasty SS men. Sooner or later we will be blessed with silence about a mountain of lies. Maybe Germany and the German people will not be taken for a financial ride. Or may grandkids Abe will claim money based on his suffering from watching grandpa “suffering”. The greatest hoax ever told! There is no business like Shoa business!! …but is because they are at their most impressionable then. Ms Yeager, I have a couple of questions I would like to ask you. Questions: Where did you obtain a copy of the trial transcript? Do you still have a copy? Due to this comment I left on the ‘Scrapbookpages blog, I’m particularly interested in verifying that Wiesel was not asked to show his tattoo in court. Also, perhaps a small correction: the trial of Hunt was held in the court of Robert Dondero (not Donder) — he is now an appellate justice. eah – I can tell you that Wiesel was NOT asked to show his tattoo in court, no he was not. Ask Eric. His lawyer was trying to save him from a 15 year or so “hate-crime” prison sentence (which he did), so upsetting Mr. Wiesel was not a good idea. I don’t remember where I read the transcript, only that it was online. Thanks for correcting Dondero’s name. …at the beginning of this so-called apology, taking up about half the so-called letter, that simply makes me want to puke. I would be inclined to sue him for libel based on this Holo-firmation of Faith alone. It is certainly not a sign of repentance. Now I’m a pretty good lawyer and judging by her investigative work and that putting the lie to so MANY things so would be Carolyn. Then there’s of course Porter – no question. And as the volunteer curator of Holocaust Handbooks Rudolf has more of the info and refutation in his head than anyone alive, or likely to be. I wonder how much our friend down in good old Lancaster is worth? (When I was about 8 my father had occasion to show me in a phonebook from a phone booth in nearby Reading a list of names saying: “See, there are a lot of Hains here.” Probably still true.) It would serve them right for trying to wheel so many Germans into court on a gurney! Every cent he possesses. And the lies repeated and repeated and known to everyone in the room including the judge as lies, would not be so easily tolerated here – even with a “judge” of someone like Hirt’s lineage. Bruce – I realized some time back that I would have been a good lawyer, but it had never occurred to me. Being German, I was interested in art, drawing, literature and philosophy (really), and that’s about it. I was a good writer but I didn’t think I wanted to write at the time. So I missed out on being a high-priced, high-powered lawyer … haha. Another lifetime, maybe. I’m practicing now. Really, I don’t see how any court is going to find anyone guilty of lying about the Holohoax. It’s entrenched truth. And as far as impersonating a survivor, who would be the victim? By their standards, no one. LOL! Reads like it was plagiarized from some sleezy pulp novel about WW2. Tor – yeah that’s one of the most far-fetched, but it just slides past defences of most people probably. These semites are so jingoistic and read it into our personalities when they’re lying about us. Moslems too, that’s how you get these crazy moslem nuts willing to kill anyone. Carolyn – Sad, given state of censorship & PC and how it’s getting set up here despite a law against it. Now while US is the only hold-out is probably our last chance. Spread it around, it’s very good.